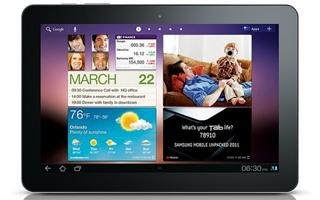 The 8.9 Galaxy Tab from Samsung is one of the best and most powerful tablets available in the market right now. It is appealing to a lot of business users especially as it is very portable to carry around and has same processor and innards as the 10.1 Tab. Rooting the 8.9 Tab will allow you to do much more with the tablet, including the ability to run apps that require root access. This guide is for the Wi-Fi only 8.9 tab. Download the rom.zip and USD drivers file from here and here. Then, you must transfer it to your Tab. You can do that either by sending an email to your tab or by using Samsung Kies. Turn off your tab completely and remove the USB cable. Turn on pressing and holding power button+Volume Down button (next to the power button) for 15 sec, until two icons show up on the screen. Then, release buttons and press once Volume Down button (next to the power button) to select “Recovery Mode” is the little box icon. Select “Recovery Mode” pressing once Volume Up button (button far from power button and Volume down button) and wait until “Recovery Mode” screen show up. Use Vol down or Vol up to select apply .zip from SD card and press power button to select the option. Browse for the file rom.zip under the SDCARD and select it with power button and apply the root.zip. Follow by a reboot. Go to the Marketplace and install Superuser from there. A lot of blotware will be removed, including Swype. All credit goes to the xda-user mramirezusa. Without him, this root would not have been possible. Since, you have not performed its root, feel free to read our Samsung Galaxy Tab 8.9 review.